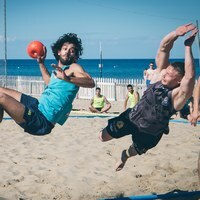 The Polish town of Stare Jablonki is the centre of European beach handball for the next four days. 24 teams, 12 in the men’s and 12 in the women’s event, have registered for the season’s first major European tournament. In both events the participating teams have been seeded into two groups of six teams each. Two and a half days of group phase action are followed by the quarter-finals on Saturday night, for which the first four teams of each group qualify. The semi-finals are played on Sunday morning, followed by the finals on Sunday afternoon. The best about this action-packed schedule? All matches from all courts will be streamed live on ehfTV. On top of the live coverage, make sure you also follow beach handball social media on Facebook, Instagram and Snapchat. Detono Zagreb, who won six out of the last eight ebt Finals men’s events, all apart from those in 2013 and 2016, are back in action and arguably one of the tournament’s favourites. They are likely to be challenged by BHT Auto Forum Petra Plock, who came second at the ebt Finals in 2017, and enjoy the Polish home advantage in Stare Jablonki. With Club Balonmano Playa Algeciras and Multichem Szentendrei N.K.E. the clubs placed first and second meet straight away in the women’s group phase, as both of them have been placed in group A. The Polish home team in the women’s event is KS Red Hot Czili Buk. The first matches throw off at 9:00 CET on Thursday in the women’s event. The first men’s matches are played at 11:15 CET.